Sponeta table tennis table for club and school sports as well as advanced private use ! The one-handed operation makes this security system so comfortabe. The loud handle is visible for every position of the table and from all sides. The pull rod under the playing surface disengages both safety devices at the same time. 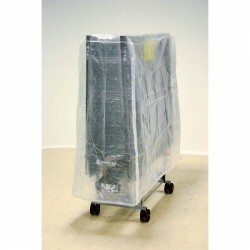 In storing position, playing surfaces have to be put in vertical position so that locking is automatically engaged. In playing position, lockings already engage safely before achieving horizontal position. They guarantee a great stability even on uneven floors. 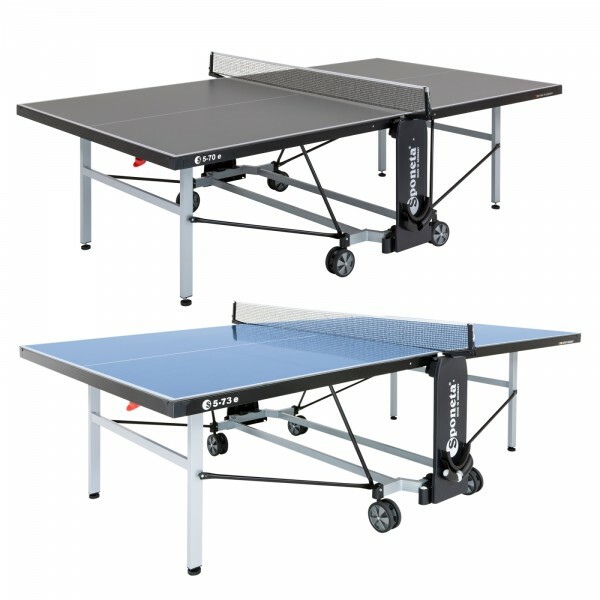 The Sponeta table tennis table S5-73e is equipped with a 6mm melamin resin board. These melamin resin boards are resistant against humidity and sunbeams - ideal for playing table tennis outside. Furthermore, the thick melamin resin board of the Sponeta table tennis table S5-73e offers excellent ball spin features. The innovative bracket-folding system allows an easy, fast and - above all - safe access to the Sponeta table tennis table S5-73e. By using the metal bracket below the frame profile with both hands, both lockings on the right and left side can be simultaneously unlocked. The playing surfaces can be moved from playing to storing position and vice versa by means of this bracket system. In combination with its extremely sturdy base, the Sponeta table tennis table S5-73e is optimal for club and school sports as well as advanced private use. Great product. Fast delivery. 5 out 5. Very happy with this purchase. Sturdy table with good bounce. Easy to fold and unfold Adjustable legs for uneven ground The online video for assembly is very useful, allow about 2 hours. Great table tennis table. Very good quality. Took about 2 hours to build up, I recommend the Youtube installation video. Good table ingenious mechanism for folding and unfolding is really good. Takes time to put together, and very heavy. would have awarded 5 stars but the metal frame around the table could be thicker and was bent in places on my table. Donic-Schildkröt 3* table tennis ball Avantgarde Poly In stock! Donic Schildkröt table tennis bat Ovtcharov 800 In stock! 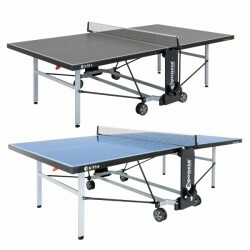 Sponeta table tennis table S5-73e add to comparison list.